Movie rental chain Blockbuster will end its retail and mail order services by January of next year. Blockbuster, which was bought by Dish Network (DISH) in 2010 after going bankrupt, will shutter its domestic operations, including approximately 300 stores and all distribution centers. It's the nail in the coffin of a brand that has been steadily declining. In January, the company announced plans to close 300 stores and cut 3,000 jobs. 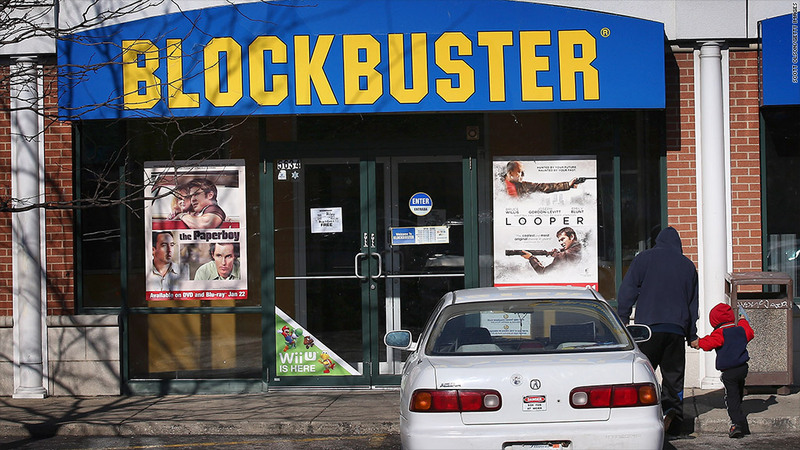 Blockbuster has struggled in recent years to compete with Redbox, a DVD rental and digital streaming service provided by Outerwall (OUTR), formerly Coinstar, and Netflix (NFLX), which offers movies and TV shows for digital streaming in addition to its mail order DVD rentals. Blockbuster By Mail, a service launched to counter Netflix, will end in mid-December, but the streaming service Blockbuster On Demand will remain intact. DISH said Blockbuster franchises and licensed stores in the United States and internationally will stay open. DISH will also maintain its licensing agreements with Blockbuster -- which includes 15 movie channels and thousands of movies -- so its customers will still have access to Blockbuster Home Services.